"Daddy, I met a man in Rome. And he's handsome and brilliant and we're getting married." Do you remember that line? I could recite every line from this movie! I have seen it so many times. It is honestly my favorite movie of all time. George Banks is my father. Or at least he will be when I'm finally engaged. He will be the parent that loses their mind about how I'm too young, and he's (the guy) probably unemployed, and he drives too fast, and wears the wrong shoes. Oh, and he will most definitely despise my wedding planner. 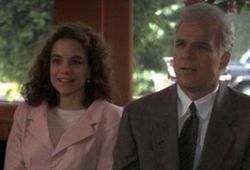 But I love my dad, and it's ok if he does act like George Banks. Annie: "He's an independent communications consultant." George: "Independent? That's code for unemployed." George: "Don't forget to fasten your condoms! Seatbelts! I mean seatbelts!" George: "Twelve hundred dollars for a cake? My first car didn't cost that much"
Franck: "Welcome to the nineties, Mr. Banks"
George: "I use to think a wedding was a simple affair. Boy and girl meet, he buys a ring, she buys a dress, they say I do. I was wrong. That's getting married. A wedding is entirely different." "Twelve hundred dollars for a cake?" "Who else can we ask not to eat? My parents? Your mother?" Is it really surprising that this is my favorite movie? I mean, come on, there's romance, there's father-daughter love, and there's a wedding! In my opinion it doesn't get any better! Did you all love this movie as much as I did? Do you have a movie that you hold close to your heart like I do this one? I love this movie! Just watched it recently with my mom and we both cried! I will definitely be wearing waterproof mascara when B and I get married! BTW- I left something for you on my blog! Aww I love this movie! Im related to Steve so Im a little biased! This is a good movie! I love this movie! This is the second time this week I have seen it pop up on a blog! I love this mvoie.. but i havent seen it in forever.. i should watch it! i have always LOVED their house!!! wouldn;t you love to live there and make memories?!?! Love it. I think one of my favorite movies that gets me weepy like that is "Love, Actually." I LOVE this movie soooooo much! I love, love, love this movie... and now I need to watch it again. this is a really nice movie. i like when theyre both pregnant is this the movie? it is right? My Husband makes fun of me for how many times I have seen this movie. I LOVE IT!! 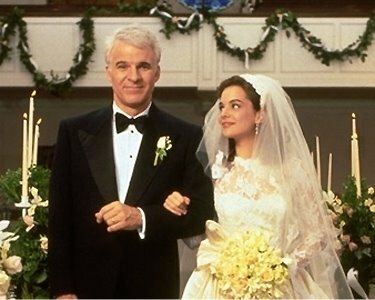 I LOVE LOVE LOVE Father of the Bride!! (I & II) So good! I love this movie. My parents live in a house in Chapel Hill NC that looks so much like the house in the movie.